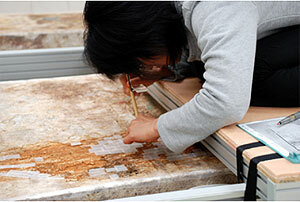 The National Research Institute for Cultural Properties, Tokyo holds in-house research seminars. During these seminars, researchers of the Departments and Centers in the Institute present the results of their research projects along topics they themselves have established, and all the researchers in the Institute are given opportunities to freely discuss their thoughts. 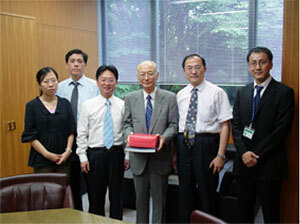 The first In-house Research Seminar was held on Tuesday, June 5. Futagami Yoko of the Japan Center for International Cooperation in Conservation presented her project entitled “Construction of GIS Database of Cultural Properties and Earthquake Hazard Assessment” in which she discussed the importance of using GIS as disaster prevention measures for cultural properties. As a part of the Cross-Disciplinary Study of Art Materials and Techniques, a research project being undertaken by the Department of Research Programming, a hollow dry lacquer Figure of a Standing Bodhisattva (private collection in Tokyo) was investigated on Thursday, June 21. In hollow dry lacquer technique used for a Buddha statue, a clay mold is first made. Then hemp cloth is pasted to the surface of the mold after which the clay is removed from the mold to make a hollow. Finally an over-layering of lacquer stiffened with plant fibers is applied to the surface of the hemp cloth. As is already known, the manufacture of Buddha statues using this technique was popular in Japan during the Tempyo period (8th century), but there are very few existing examples today. In such a circumstance, this Bodhisattva figure is an example whose existence was not known until recently Although there are traces of gold foil applied with lacquer on its surface, which is thought to have been done after the figure was made, and traces of repair on damaged parts, the condition of its preservation is comparatively good. It is also to be noted that the figure has been transmitted in an almost complete form. From the expression of the precious chignon and the form of the face, it appears that the figure was manufactured either at the end of the 8th century or the beginning of the 9th century. However, as is the case with the investigation of hollow dry lacquer figures, it is true that a visual observation of the surface does not provide enough information as to how many layers of hemp cloth had been applied or to what degree restoration and later additions had been made. We hope to conduct X-ray photography of this figure, with the permission of the owner, in order to study the materials and techniques used so that we may better understand it. The Department of Intangible Cultural Heritage is engaged in studies related to the conservation and utilization of intangible folk cultural properties of Japan. As an example of research associated with the actual transmission of folk performing arts and their performances, an on-site investigation was made into the activities of kagura Monzen Toji Mura at Midoricho, Akitakata-shi, Hiroshima prefecture. Midoricho (formerly Midoricho, Takata-gun, Hiroshima prefecture) is known for geihoku kagura, a type of kagura that has been transmitted in the northwestern area of Hiroshima prefecture. Presently there are 13 kagura troupes that are active, and some of their repertories and groups are designated intangible folk cultural properties of Hiroshima prefecture. However, the reason that this type of kagura is well known today is because the repertories called shinmai, which was created after the War and which incorporates new tastes, has become firmly established among the people of the area as a form of entertainment. kagura Monzen Toji Mura is a facility for relaxation and entertainment that was opened to the public at Midoricho in 1998. This and the kagura Dome, a theater especially for kagura with a capacity of 3000 people, function as symbols for the popularity of this new type of kagura. At kagura Dome regular performances are held every Sunday and on national holidays by kagura troupes of Midoricho. In addition, on Saturdays open rehearsals are held at Kamukura Theater, an indoor stage attached to the facility as are various kinds of kagura competitions, such as the Hiroshima kagura Grand Prix. These performances are attended by people from not only Hiroshima but also other prefectures. Moreover, since the theater is opened to the public as a place that can be used regularly for the practice of kagura and since opportunities for performances are guaranteed throughout the year, for the kagura troupes of Midoricho it serves as a site for transmitting kagura. Since many of the audience are residents of neighboring districts, it may be said that this is a facility that is firmly rooted in the area. Although kagura of this nature, the purpose of which performance is entertainment,　may be thought to be rather new, it has been reported that kagura and bon-odori competitions have been held in areas around Hiroshima prefecture from before the War. The oldest competition that is still being held today dates to 1947 and has a history of over 50 years. 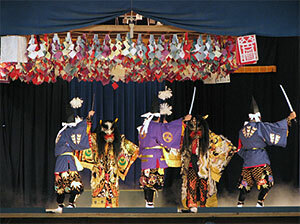 In addition to popular shinmai, competitions are also held in the skills of kyumai, the traditional repertories. Thus the fact that these events support the transmission and vitalization of traditional repertories cannot be overlooked. The popularity of “kagura as entertainment” as found in Midoricho is spreading to neighboring Shimane and Okayama prefectures today. Of course, some issues have been pointed out for consideration, such as economic stabilization, apprehension concerning changes in the nature of kagura and the question as to whether major performing groups should be limited to kagura troupes of Midoricho or not. However, it is also a fact that such a phenomenon is effective in the transmission of culture and the formation of the identity of a given area. It may be said that this phenomenon is a very interesting example of the transmission of folk performing arts in today’s world. 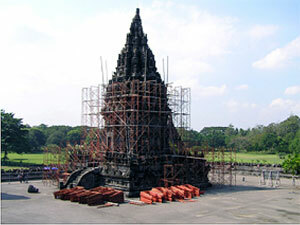 The investigation team that was dispatched last year conducted basic investigation of the Prambanan Temple Compounds, a World Heritage, which was destroyed by the earthquake that shook the Island of Java on May 27, 2006. The investigation included a survey of the condition of damage, history of restoration, ground property, vibration character of the structures and other issues. At a meeting of experts that was held at the site on June 29 and 30, 2007 the results of investigation, including that of the foundation and structures conducted by the Indonesian side, were discussed comprehensively. Based on this, fundamental ideas regarding the policy of restoration, including a partial dismantlement, and work procedures were decided. 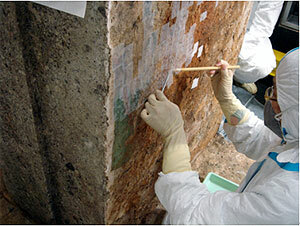 In addition, investigation items necessary to actually carry out restoration were discussed. Japan’s technical cooperation will consist of providing necessary support for drawing restoration plans, within this fiscal year, for the Prambanan Temple, which holds a central position within the entire compound and whose early re-opening to the public is desired. In concrete terms, a seismograph will be installed to elucidate the vibration character of the structure and thereby propose necessary methods for structural reinforcement. In addition, orthographic images will be made and the condition of damage of each stone, method of restoration and areas of dismantlement will be indicated on them in order to prepare a detailed plan for restoration that will make an estimation of the cost possible. For this purpose, another on-site investigation is scheduled to be made after September.